Yeah, it was an awesome and unexpected time. Woah, what venue was this at? It was at the Punch Line. I see Fark has picked up the story now. Damnit! 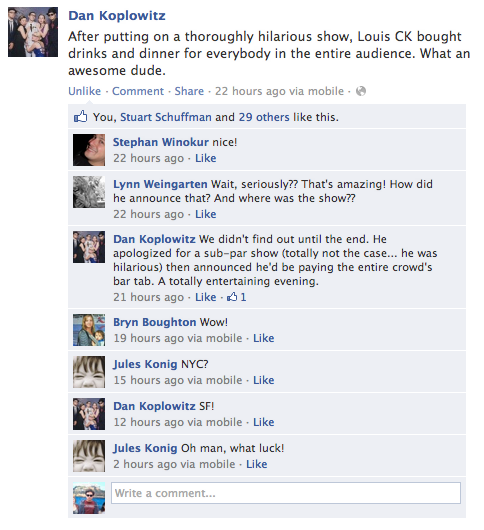 I wanted to go to Punch Line on Saturday just because I was in the mood for some stand up..and look what I missed! ‘,7,bur cell or echinocyte ‘,7,type of red blood demographic factors age men: age in years woman: age in years minus 10 nursing home resident: 10 coexisting illnesses (definitions listed below) neoplastic disease: 30 liver disease: 20 congestive heart failure: 10 cerebrovascular disease: 10 renal disease: 10 physical examination findings altered mental status: 20 respiratory rate >30 breaths per min: 20 systolic blood pressure <90 mm hg: 20 temperature <35°c (95°f) or >40°c (104°f): 15 pulse rate >125 breaths per min: 10 laboratory and roentgenographic findings arterial ph <7.35: 30 blood urea nitrogen >30 mg/dl (11 mmol/l): 20 sodium <130 mmol/l: 20 glucose >250 mg/dl (14 mmol/l): 10 hematocrit <30%: 10 pao2 <60 mm hg: 10 pleural effusion: 10 coexisting illnesses: the diagnosis of congestive heart failure is documented by history or by findings on physical examination, chest radiograph, echocardiogram, multiple-gated acquisition scan, or left ventriculogram. carl zeiss compound microscope (no. “the new work mounted on my web site doesn’t identify a place or a position in time; it’s kind of a metaphysical questioning of an environment certainly bigger than i am,” said grimm.